WASHINGTON, Aug 1 2018 (IPS) - The world’s food systems face two immense challenges today. One, to produce enough food to nourish a global population of seven billion people without harming the environment. Two, to make sure food systems deliver nutrition to everyone, particularly the world’s poorest, many of whom suffer from chronic under-nutrition. Like the Economist’s 2017 Food Security Index, a new report released earlier this summer looks at the complex connections between the ways we organize and produce our food, and the implications for the environment, human health, and social wellbeing. With input from over 150 experts from 33 countries, The Economics of Ecosystems and Biodiversity (TEEB) for Agriculture and Food: Scientific and Economic Foundations Report, a United Nations Environment Programme (UNEP) project, makes the case for a global agri-food systems transformation. It argues that our agri-food systems today are being viewed and evaluated through a narrow, incomplete and distorted lens by focusing on per-hectare-productivity. To fix our food system, our food metrics need to be fixed. The way we are currently producing food is negatively impacting climate, water, top soil, biodiversity and marine environments. If we do not change course, we will seriously undermine our ability to deliver adequate food for future populations. In addition to the negative environmental impacts, we are struggling to deliver nutritious and healthy diets in an equitable way. Diet-related chronic diseases are on the rise even as we fail to deliver nutritious food to millions of poor people around the world. •	Agricultural production alone contributes over one-fourth of global GHG emissions. •	However, when considering the entire ‘agri-food value chain’ (including agriculture-related deforestation, farming, processing, packaging, transportation and waste), this number climbs to a staggering 43 to 57 percent of GHG emissions. •	70 to 90 percent of global deforestation is from agricultural expansion. •	If women had the same access to resources (land, credits, education, etc.) as male farmers, they could raise yields by 20 to 30 percent, and lift as many as 150 million people out of hunger. •	Approximately one-third of the food produced in the world for human consumption every year gets lost or wasted, enough to feed the world’s hungry six times over. •	Around 40 percent of available land is used for growing food, a figure that would need to rise to an improbable 70 percent by 2050 under a “business-as-usual” scenario. •	33 percent of the Earth’s land surface is moderately to highly affected by some type of soil degradation mainly due to the erosion, salinization, compaction, acidification, or chemical pollution of soils. •	Diets have become the main risk for human health. Six of the top eleven risk factors driving the global burden of disease are diet-related. •	The World Health Organization estimates the direct costs of diabetes at more than US$827 billion per year, globally. •	Unsafe food containing harmful bacteria, viruses, parasites, or chemical substances causes more than 200 diseases. An estimated 600 million people fall ill after eating contaminated food, while 420,000 die every year. •	61 percent of commercial fish populations are fully fished and 29 percent are overfished. •	In a “business-as-usual” scenario, the ocean will contain more plastic than fish (by weight) by 2050. The agricultural revolution is still very strongly influencing our food production. While food production has successfully been increased, the environmental impacts have received a lot less attention. They have been either been ignored or been considered as a necessary trade-off. The Economist’s 2017 Food Security Index for example, in considering how resilience to natural resource and climate related risks pose long term threats to food systems across countries, includes a tool to explore how individual countries perform on a natural resources and resilience adjustment factor. “If you look at food production only from a price perspective, and the old paradigm of the cheaper the better, you run into a trap because the long-term sustainability of our food production system is not a given,”says Alexander Müller, Study Leader of TEEBAgriFood. Tackling these challenges requires a systematic approach. 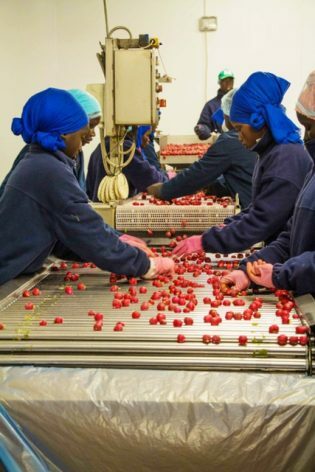 This report looks at all the impacts of the value chain, from farm to fork to disposal, including effects on livelihoods, the environment, and health. It identifies theories and pathways for transformational change in government, business, farming, and consumer contexts while providing a framework for evaluation that supports the comprehensive, universal and inclusive assessment of eco-agri-food systems. Recognizing the interlinkages, in terms of impacts and dependencies that food systems have with our economies, societies, health, and environment is a crucial first step. Using the report’s Framework and its language can allow for the next generation of agricultural and food research to provide a more comprehensive basis for decision-making and together with the 2017 Food Security Index, provides a comprehensive assessment of food systems as well as natural resource availability and resilience.